The first inhabitants of the Pee Dee Area were the Pee Dee Indians. In 1730 Robert Johnson the first Royal Governor of S.C. ordered eleven townships to be created. Each would contain 20,000 acres, and each man, woman and child who would improve 50 acres would receive the land free. Welch immigrants from Pennsylvania settled in the Pee Dee area. Settlement was slow so the government offered bounties to people who would settle in the area. The rivers in the area were used for transportation. Life in general was frontier quality. It was a very remote area and isolated from the influence of church and state. Crime was rampant. Lack of schools were a problem also. It was written at the time, that the “lack of education lead to idle, immoral lives- follow hunting, shooting, racing, drinking, gaming,and every aspect of wickedness, more rude in manners than the savages around us”. The Pre-Revolutionary War period was quite prosperous. Cattle and horses were sold to the Northern Colonies. Lumber was an important product and the river system in the area was used to ship the lumber to the coast where it was traded. Indigo (a plant that makes purple dye) was brought in from the French West Indies. In only six years the colony exported over 200,000 pounds of indigo. The Pee Dee area was not too involved in the events that led up to the Revolutionary War because it was so isolated from the large population centers. Little happened during the war in the area until the fall of Charleston in 1780. In 1783 the cotton gin was invented and caused a dramatic effect on the South. Soon one half of all U.S. exports was cotton. Darlington district sold 13,000 bales in 1850. This dramatically increased the number of slaves in the area. Land cost 50¢ an acre. Henry Timrod lived on the plantation of Col. William Henry Cannon, who constructed a school for Timrod to teach the plantation children in 1856 and 1857. This school is located in Timrod Park in Florence today. Three railroads were constructed in the Pee Dee. All intersect in what is known today as Florence. Florence began as a railroad depot and an inn. The town started as a plot of 577 acres purchased by North Eastern Railroad Company. In 1859 Jerome P.Chase, a telegraph operator arrived and became a successful businessman, selling insurance real estate and became known as the "Father of Florence. The City of Florence was named for Florence Henning Harlee, daughter of General W.W. Harlee, president of the Wilmington and Manchester Railroad. In 1860 the first map of Florence was created. Florence was a planned community with seven streets and 96 lots. Late in 1859 war fever mounted. The Darlington Guards were formed. This unit consisted of 14 officers and 100 enlisted men. They were sent to Charleston before the firing on Fort Sumter. The PeeDee Artillery and Pee Dee Rifles were formed to fight in Northern Virginia and served in many major battles. During this time the “Wayside House”, a relief volunteer hospital, was established in Florence, under the supervision of Dr. Theodore Dargan,with 62 volunteer workers, mostly women. Soldiers who died here were buried in the Presbyterian Church Cemetary and were moved in 1905 to what is now called Mt. Hope Cemetery. Confederate authorities selected Florence to receive Union prisoners from Southern Georgia and other areas. Florence began to construct a prison stockade on September 17,1864. With construction scarcely begun 6,000 prisoners arrived from Charleston. The prisoners were suffering from smallpox, yellow fever, hunger and exhaustion. Residents feared prisoners escaping so old men and teenage boys were recruited for guard duty. Conditions were overcrowded and so bad that residents began to complain. New leadership of the prison took place and conditions improved but not before 2,802 prisoners died. During a routine examination it was discovered that one of the prisoners was a woman disguised as a man. Florena Budwin had disguised herself to accompany her husband to war. They were both captured and sent to Andersonville where her husband was killed. She was sent to Florence along with thousands of other prisoners. When the discovery was made she was given a private room and the ladies of Florence donated food and clothing. She died on Jan. 25,1865, one month before all sick prisoners were paroled to the North. Florena is believed to be the first woman service member to be buried in a National Cemetery. By the end of February 1865 the Florence Stockade was empty. By the end of the war the National Cemetery in Florence had 2,322 soldiers buried in it. After the war, the North Eastern Railroad was the primary employer, and the town grew around the transport of agricultural products from the surrounding Pee Dee River Basin. In 1888, the South Carolina General Assembly created the “County of Florence”, encompassing the towns of Timmonsville, Coward, and Lake City with the Town of Florence as its county seat. 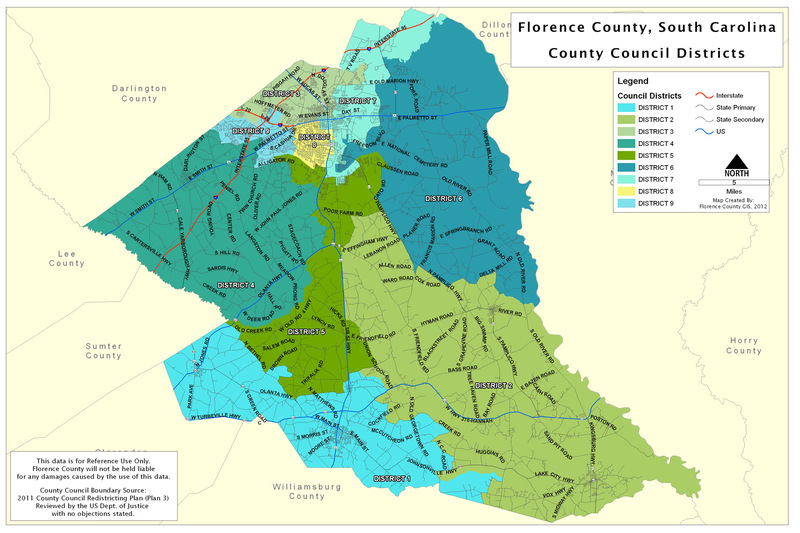 Two years later, the “City of Florence” was incorporated. Being an important rail and transportation center, Florence grew into the 20th century. In the late 1920’s an airfield was created by Mayor H.K. Gilbert and it was known as Gilbert Field. World War II brought an Army Air Base to Florence’s Gilbert Field and with it the growth of local industry. The Florence Army Air Field served as a major training site during the war. Interest in the arts grew and led to the creation of the Florence Little Theater in 1923 and the Florence Museum in the 1930’s and the Florence Symphony Orchestra in the 1940’s. During the 40’s, Florence was the largest rail station in South Carolina with 14 passenger trains and 48 freight trains passing through the city every day. During the 1960’s and the 1970’s the construction of Interstates I-20 and I-95 in Florence further helped Florence to become a strategic transportation center and brought new growth in tourism. The 1970’s and 1980’s were decades of economic growth in industrial complexes, service industries, and retail opportunities which continues into the 1990’s. Florence is the hub of an eight county region called the “Pee Dee”. It is the center for business, health care, communications, education, retail sales, cultural opportunities, and recreation.